For 515 days, my sister and I shared my Facebook profile picture, smiling to the world from a little circle above my name. My cover photo was taken that time we went to Jerusalem and she posed with my children on Yoel Solomon Street. 515 days ago I sat down and looked through all my pictures to find one of her actively living after 22 months of watching her actively dying. Now, I update the images. Changing my profile and cover picture feels like a betrayal. As if Hudis should be everywhere I am, leading me with every interaction I have online the way she walks ahead of me wherever I go. 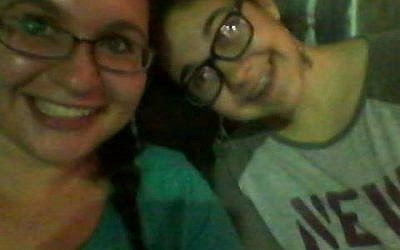 But it’s also relieving in a way like I’ve let her be my little sister again and no longer hold her above me. She’s plastered on my heart, etched on the inside of my skin…her image, a collage of the face I met when she was born, the face I kissed when she died, and every moment I saw her in between, is bright and beautiful and tucked away in the drawer of my soul where the most precious parts of me go. My daughter is watching me closely, reading over my shoulder. She kisses me gently and wipes the tear that formed when I saw that she gets me. The night my sister died I couldn’t sleep. Words were marching across the inside of my brain, demanding I let them out. I sat up in bed and wrote my goodbye. “I figured it out,” you said. It was last August, at the end of an epic summer, and you were saying goodbye. It was in the living room – on the couches you hated and in typical fashion, you spoke bluntly and decisively about the topic most people avoided around you. And Hudis you are everything. You are the courage of one lone soldier against a mighty army. You are the love that binds hearts together…. We will add notes and harmonies and a baseline that keeps us moving forward. We will write the stories of our heavy hearts and weave them through your lines. And we will surely sing it too loud and too intrusively and off-key – the only way you can possibly sing a song that can never die. You’ll always be the best. It was read to her body before we took her to a hole in the ground and covered her with dirt. We sat in our puddles of grief and people came and tried to comfort us. But I am not comforted by words spoken at me. The words that comfort me fly from my fingertips, race across the screen and scream with intensity as my lips close and my heart slows and I can feel my lungs fill with life. Still, I have to do something. My father set up a table with a box. People dropped their dollars in as they left the weeping house. Death makes you want to do something. I sat at her computer and wrote again. where there is air to breathe. A lifeline is a last hope…an only chance…a leap of faith. so the path can be seen. Then there is Chai Lifeline. I sent it to myself and printed it out. Her name was on the top like she had written it. We made copies and put it on the table with the box of money. When we got up and walked around the block we had done something. But we still wanted to do something. Hudis was determined to run the Miami Marathon for Chai Lifeline. The day she was supposed to fly out, she woke up with a fever. She took her suitcase with her to the hospital. She never made it to Miami. 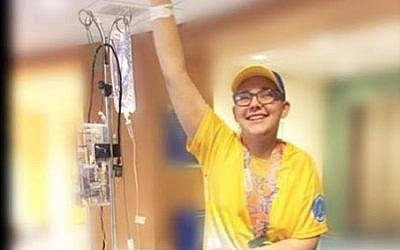 She made her own finish line in the pediatric oncology ward in Robert Wood Johnson and crossed it with a smile that tricked us all. She looked so alive. We couldn’t have known she only had four months left. Two of my sisters decided to finish it for her. They started raising money before we even go up off those chairs and they ran and walked and pushed themselves harder than they ever thought they could. I watched them and felt something stir. I crossed the ocean when it was a year and kissed the slab my sister lies beneath. I wrote again because I don’t know how to do anything else. This time I read it out loud and my voice shook. I can’t fly to Miami and run. I can’t keep the picture of my baby sister in front of me always. I can’t get my revenge on cancer. I can’t dig up the dead and force the world to stop and remember my sister and all the people actively dying while we passively live on. My older sister is running the marathon again. And I can tell you about this life and this world and the bits and pieces of who we are as we pass through. I can string words around so that you get how it feels to want to do something as you watch people who have more courage than you can imagine walk into hospital rooms, look cancer in the eye and ready their weapons to fight, no matter how many battles they may have lost. Support my oldest sister as she runs for my baby sister. I look up at her, knowing she will read my words one day. “I’m doing something,” I say.